Lotus delivered the Elise S1 with mild steel downpipes. 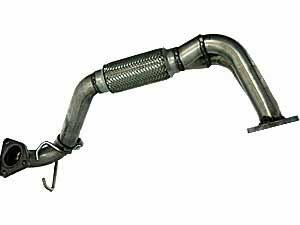 They are a well known source for troubles, specifically around the flexpiece and the manifold flange. Snapping the flex-piece means hot exhaust fumes will exit from the flexpiece, causing power loss, a lot of noise and a mot failure. This item has been produced from Stainless steel, the flex piece is welded in another way and is expected to last a lot longer then the original item.. This product was added to our catalog on Tuesday 05 July, 2005. Larini Sports Exhaust for Elise S2 with K-series engine.